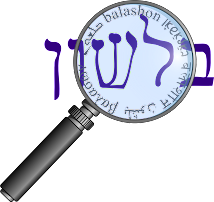 Balashon - Hebrew Language Detective: 100,000 - thanks! Just moments ago, Balashon got its 100,000th visitor. Someone (running Firefox on Linux) from Washington University in St. Louis searched for "dugri" on Google, and ended up on Balashon. When I started this thing, I never quite expected I'd get this far. While it's a pleasure for me to research and write, I know that without the readership here, Balashon would be a very quiet place.